Welcome to More Front Wing’s weekend live blog from the GoPro Grand Prix of Sonoma at Sonoma Raceway! Steph Wallcraft will be reporting live from trackside all weekend long. The page always has the most recent update at the top, so please scroll to the bottom and read up to start from the beginning. Comments are most welcome — please leave them either in the comments section below or email them to steph@morefrontwing.com. To access time sheets, schedules, and other statistical information, please visit More Front Wing’s GoPro Grand Prix of Sonoma Event Summary. 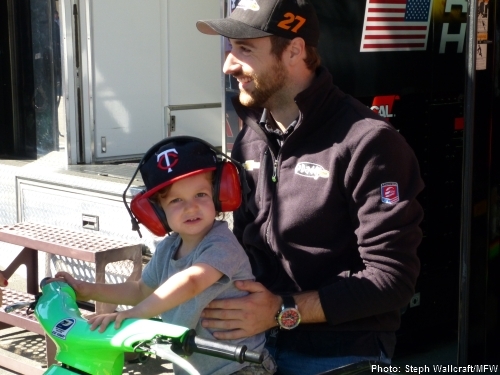 Click here to access Friday’s GoPro Grand Prix of Sonoma live blog. 4:48 PM (Pacific): And it’ll be Dario Franchitti on pole with Scott Dixon joining him on the front row for tomorrow’s GoPro Grand Prix of Sonoma. The full qualifying results can be found in our Event Summary. The other drivers present at the press conference agreed, though, and conceded that they’re all in the situation and the onus is on them to do the best job of figuring it out. The other big story is the tire strategy used by Franchitti and his team to win pole. The first and only timed lap that Dario ran in Q1 was good enough to advance, so the team brought him in and put the same tires on for their run in Q2. 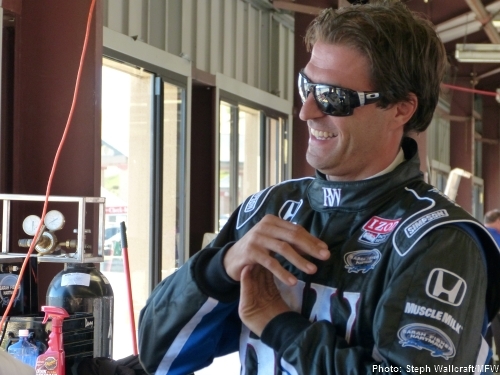 “I managed to make a couple of mistakes [in Q2], actually,” Franchitti admitted. “I was surprised to be as close to the guys on the new reds. Franchitti was then able to run a new set of red tires in the Firestone Fast 6, which made all the difference in closing the deal on his pole run. That’ll do it for our coverage of the day’s events here at the GoPro Grand Prix of Sonoma. Race day is tomorrow with morning warm-up getting under way at 10:05 AM local time (1:05 PM Eastern) and the race broadcast starting at 1:00 PM local time (4:00 PM Eastern) on NBC Sports Network. 2:21 PM (Pacific): This just in from Firestone: the organization has donated $10,000 to Racing for Kids. The content of their release is below. Today at Raceway at Sonoma, the Race Tire Development (RTD) division of Firestone Racing presented a $10,000 check to Racing For Kids, the non-profit organization that since 1989 has used motorsports to focus attention and raise funds for the health care needs of children. The RTD group donated the prize money it received for winning this year’s BorgWarner Louis Schwitzer Award, which annually recognizes engineering excellence at the Indianapolis 500. 2:13 PM (Pacific): With the easy breaks between activity here, there’s been lots of opportunity for driver appearances. There was a long line at Victory Circle for a chance to have a photo taken with Takuma Sato a little while ago. 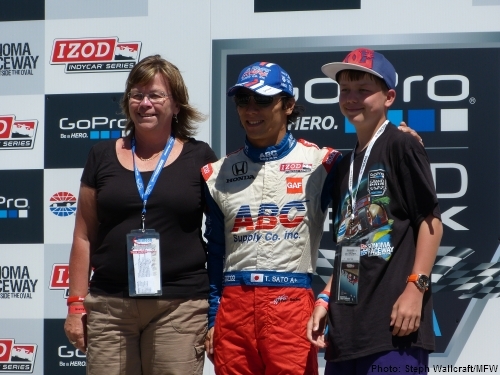 Takuma Sato poses for photos with fans on Saturday at the GoPro Grand Prix of Sonoma. 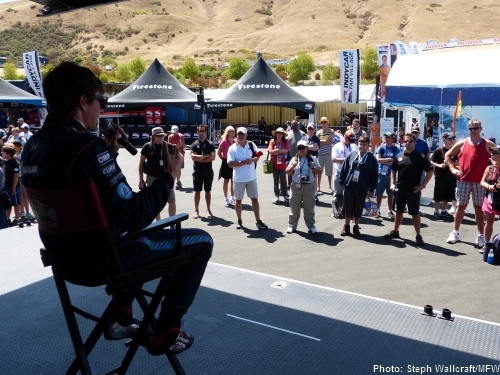 JR Hildebrand answers fan questions at the Barracuda Racing tweet-up at Sonoma Raceway. The strong turnout made me wonder if tweet-ups might be making a comeback — it seemed like they weren’t catching on for a little while, and that made me sad. I’ve met some great people and made some real-life friends at these things. (And not just passing-hello friends — some serious, lasting friendships.) Here’s hoping that these things can regain steam and give serious IndyCar fans a way to connect. Racing has a kind of special way of bringing people together. 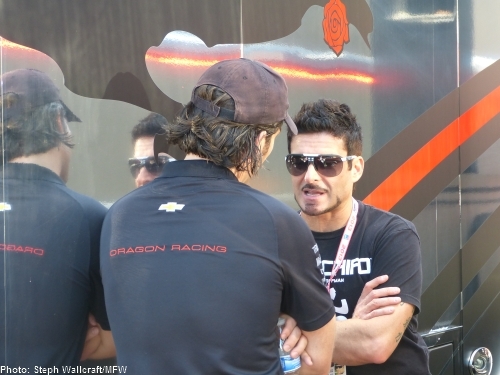 Alex Tagliani catches up with Jay Penske in the paddock at Sonoma Raceway. Anyone care to read entirely too much into this photo? Ladies and gentlemen, start your rumors. We’re now just waiting for qualifying to begin at 2:30 PM Pacific as the Formula Car Challenge runs in the background. This is such a low-key event compared to what I’m used to — there is not a thing frenetic about this place. It’s lovely. 10:54 AM (Pacific): The paddock has a very relaxed, West Coast kind of feel this morning. Below are some photos snapped around the garages just before Saturday morning’s practice session. 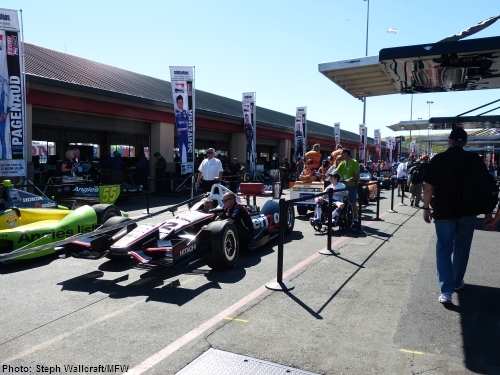 A view of the paddock at Sonoma Raceway as the IndyCars prepare to pull out for Saturday morning practice. 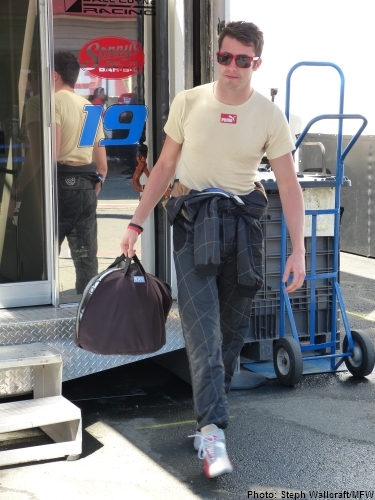 James Davison heads to pit lane for Saturday morning practice for the GoPro Grand Prix of Sonoma. Lucas Luhr on Saturday morning at the GoPro Grand Prix of Sonoma. 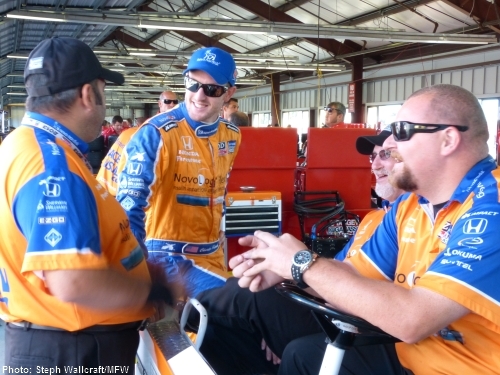 IndyCar’s most recent race winner, Charlie Kimball, jokes around with his team before morning practice at Sonoma Raceway. 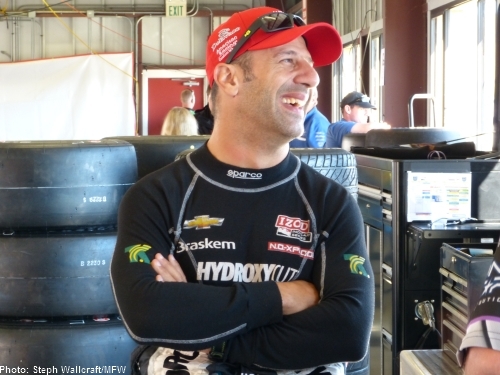 Tony Kanaan looks relaxed on Saturday morning at the GoPro Grand Prix of Sonoma. 9:57 AM (Pacific): Good morning from beautiful Sonoma Raceway! It’s another perfect day here in Northern California as the chilly morning mist is giving way to clear skies. The projected high is somewhere around the high 80s, but it never feels terribly hot — there’s no humidity, and the constant breeze makes the temperatures very bearable. I’m told that the weather is almost never not perfect here. I can’t help but feel like the constant perfection would start to feel strange after a while, but I’ll certainly take it! Yesterday’s live blog sort of turned into a travel brochure for the Bay Area and Sonoma Raceway, so if such information is of interest to you then please click on the link. I’ll do some more real work today, I promise. We’ve got IZOD IndyCar Series practice getting under way this morning at 11:00 AM Pacific (2:00 PM Eastern) and Firestone Fast 6 qualifying at 2:30 PM Pacific (5:30 ET) with the NBC Sports Network broadcast airing at 9 PM ET tonight. On the subject of times, I could definitely get used to this idea of late starts to the day for west coast races. The mist doesn’t lift until about 10:00 each day and the medical helicopter can’t land until it does, so there’s no point in running before that time. For me, still operating on Eastern time, that means I wake up on my own at about 6:00 each morning feeling like I’ve slept until 9. I’m decidedly not a morning person, so this is pretty close to nirvana for me! By the way, if you enjoy our coverage this weekend, please consider clicking the banner at the top of this page and making a donation to the Indianapolis chapter of Greyhound Pets of America. More Front Wing wouldn’t be here to report on the GoPro Grand Prix of Sonoma if not for the support of the sponsor who has asked us to raise awareness for this wonderful organization, so your support would be greatly appreciated. Off to go for a wander and snap some photos before practice gets under way! 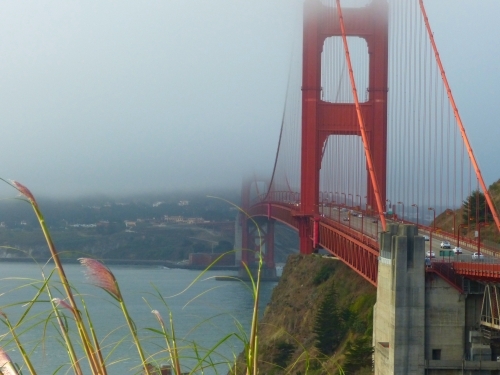 The view of the Golden Gate Bridge as I crossed from San Francisco on the way to Sonoma Raceway this morning. The scenery in this area is simply stunning.